We Can Never Say Thank You Enough! 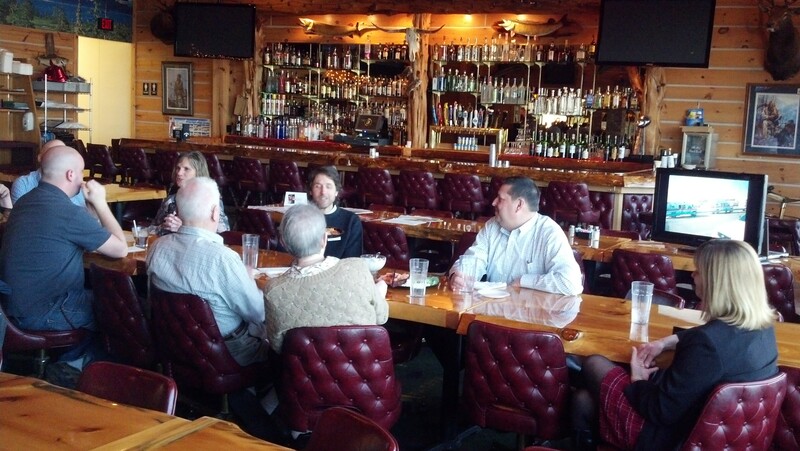 Donors, Board Members and Volunteers at Kodiak Jack’s in Oshkosh. It’s always our pleasure to be able to thank our donors for giving us the ability to serve others. In the last couple of weeks of RED CROSS MONTH, we had three Donor Appreciation Events. They were casual gatherings complete with appetizers and volunteer interaction. Not only were they successful in saying thank you, but were a lot of fun to boot! Our attending donors were able to meet board members, staff members and most importantly, the volunteers that serve our organization. The pictures that were shown and explained, were mostly regarding “Superstorm Sandy”. Our volunteers were also able to discuss what an ERV (Emergency Response Vehicle) was and how versatile they are, along with other mysteries about how the Red Cross gets things done in the field. The donors and many of the rest of us were riveted to the stories of survival and the ability of those affected to overcome any situation with the help of a “friend”. The Red Cross volunteers are those “friends” that show up to do whatever needs to be done. They are worth their weight in gold!! The donors also asked questions about SAF (Services to the Armed Forces), Blood Services and other aspects of the American Red Cross. Our board members and staff were there to answer those questions and more. We would like to thank Big Tomatoes and Los Banditos in Green Bay, Mark’s East Side in Appleton and Kodiak Jack’s in Oshkosh for their hospitality and donations to make these events happen. We also would like to thank the volunteers, board members and staff members that were fully engaged in this endeavor. We could not have done it without them!! This event – Dine for Disaster – invites patrons to simply eat-out at participating restaurants on Thursday, May 17, 2012. More than 180 participating restaurants will donate a portion of the day’s sales and collect customer’s financial donations to benefit local disaster relief and community disaster prevention efforts of the American Red Cross. While the Red Cross responds to big disasters such as floods, hurricane, tornadoes each year, but the most frequent threat people face is a fire in their own home! Last year, Chapters responded to nearly 63,000 fires. That’s one every eight minutes! In each case, we meet with the victims and assess their needs – often while still standing on the street while their home burns or smolders in smoke. Based on their needs, we provide a warm place to sleep, food to eat, infant supplies, we can replace medications, glasses, etc and we provide compassion, a recovery plan and hope to all disaster victims. Nathan and Marcia Haupt of Schreiner’s Restaurant in Fond du Lac and Pat Beimborn of Los Banditos in Green Bay are spearheading Dine for Disaster with their fellow restaurateurs. For the second year, Society Insurance is the corporate sponsor for Dine for Disaster. The Northeast Wisconsin Chapter serves 20-counties throughout northeast Wisconsin and the Michigan boarder communities. To learn more about Red Cross programs, volunteer opportunities, and how you can help, contact your local office or the regional headquarters at 920-231-3590. We can also online at www.NEWRedCross.org on Facebook (American Red Cross – Northeast Wisconsin Region), Twitter (NEWRedCross) and our blog (newredcrossblog.org). It was a HOT one for the American Red Cross Lakeland Chapter 22nd Annual Lakeland Chapter Golf Classic held on Monday, May 24, 2010 at Brown County Golf Course. Bill showing some of his trick shots. Joining us this year were 34 teams for the 18-hole scramble event. The day kicked off with Bill Schroeder, former Packers Wide Receiver, and current long drive/trick shot artist. Bill showed off his amazing golf talents with a 20 minute demo on the driving range sponsored by Packers Alumni Association. Two teams also had the chance to win the ability for Bill to golf for 9-holes with their team. The event also featured Red Cross education at many of the holes including adult conscious choking, an overview of how to use an AED, an overview of transportation service, disaster services, and information on blood donation. The day of golf concluded with awards and dinner. Contributing sponsors included: Dinner Sponsor – US Paper Mills; Media Sponsor – WFRV-TV5; Hole-in-one Sponsor – Brennan Buick, Course Signage – Quick Signs; Golf Ball Sponsor – Cellcom; Range Balls – Chris Vanderheyden, Board Member; Margarita Sponsor – Los Banditos. “I want to thank the golf outing committee including Pat Beimborn, Gerald Henley, Ray Kopish, Chad Resar, Barb Vanden Langenberg, Steve Maricque, Jody Weyers and Mauree Childress for their time and energy in making this year’s event a huge success,” said Chris Vanderheyden, Board Member and Golf Committee Chair. The $21,000 raised from the Lakeland Chapter Classic will go to support services in our eight counties including; families affected by disasters, provide rides for those 60 and over and those with disabilities get to medical, nutrition and employment needs, and continue to provide life-saving training classes for people in our community.